Lauren Frost Press Release on Digg.com! Radioindy has published Lauren Frost review to YouTube.com. 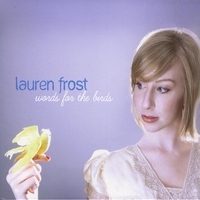 Radioindy is pleased to announce that we have published our CD Review for Lauren Frost to YouTube.com. FANS - Please checkout Lauren Frost page and sample / purchase some great new music! RadioIndy is pleased to present Lauren Frost with a GrIndie Award for the CD "Words For The Birds"
Singer/songwriter Lauren Frost has created a fine collection of memorable pop songs with “Words For The Birds,” an outstanding set featuring skillful musicianship, clean production and most notably, her soulful vocals. “Wait & See,” “Take It Slow” and “Hello Lovely” are all great examples of her polished and refined sound, intelligent writing, and soaring vocal ablilities. The supporting cast of musicians is very talented, providing exceptional solos and support throughout. Listen to the funky swagger of “Heavy In Your Shoes” and the melodic pop of “Sangria Tale,” where Frost’s infectious personality really shines through. Another highlight is “Little Boy,” which features a percussive groove and showcases Frost’s ability to blend harmony and melody so beautifully. The remix version of this track will have you ready for the dance club. “Cheezits” offers a look into Frost’s humorous side, and she gives a witty, entertaining performance by once again injecting her personality and style into the track. The album also includes the tender moments of “Whatever Happens” and “Drop Off My Heart” which are expressive, soulful ballads that showcase Frost’s immense vocal range. This is an impressive release from a very talented singer/songwriter that is highly recommended for fans of female vocalists and melodic pop. "Words For The Birds" Reviewed by RadioIndy.com!